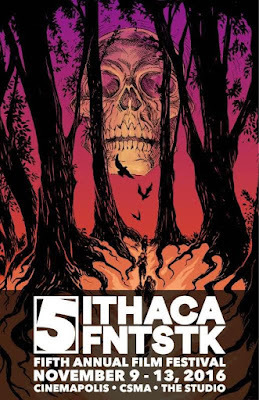 I was planning on making a road trip and going to Ithaca Fantastik this year. Mondocurry went last year and had a blast. I covered it last year and found the selection of films to be second to only Fantasia (and that was number one because of the depth of their programming). They had programmed so many great films, many I had never heard of before, many of which became new favorites, that I had to go. The trouble is that the festival collides with plans for a friends wild birthday party so I had to pass…but you don’t have to. If you can get to Ithaca New York you need to go and attend the festival. In the two years that I’ve been aware of the festival it has made me drool at all of the cinematic goodies they are presenting for your delight. It’s absolutely awesome. It has everything from old classics (Naked Prey, Aliens, Deliverence) to new ones that will delight you (Autopsy of Jane Doe or Master Cleanse perhaps?). This maybe the best small scale genre fest I’ve run across. It’s so good that somewhere around May Mondo and I were trying to work out when the festival was and whether we could road trip this year. As it stands now our coverage is going to be a little light. While I have some irons in the fire concerning getting additional coverage I’m currently reduced to giving you some links of past films we’ve seen. I can’t tell you how good this festival is. Go if you can. If you can’t check back here between the 9th and 13th to see what sort of coverage we’ve beaten out of our favorite lab assistant.